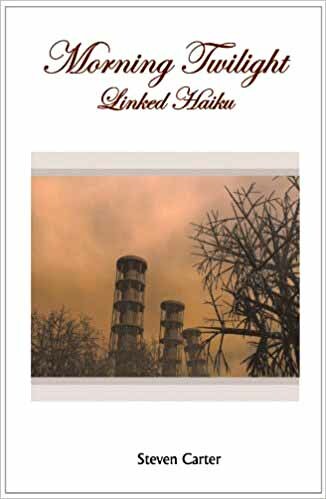 Steven Carter, retired Professor Emeritus of English and award winning poet, has chosen critical historical locales and periods in Europe and America as the subject of his book of haiku, Morning Twilight (Cyberwit.net, 2012). The choice is both unusual and welcome, as it eschews the quietism, the escapism, of much haiku written in the past half-century. Steven Carter is politically engaged, not detached; he is aware of the tragedy of time and does not seek refuge in an imaginary haiku moment where time stops and the aspirant exists in an eternal moment. The formatting of Morning Twilight itself has something to say about history. The author moves from periods in the past to the future, then to the long past and back to the future, not randomly, not to reduce all history to repetition, but certainly to disavow any lingering doubts that history is sequential, chronological, that humankind is moving towards a particular teleology: the perfection in time. As George Kubler noted in his essay “Style and Representation of Historical Time (Annals, N.Y. Academy of Science Vol. 138, Art. 2 1967, pp. 849-855), the writing of history resembles the art of painting insofar as its selects among the complex of events what to represent and it figures it in a particular way. And, style of presentation has its own politics, its own truth. Steven Carter begins his book in Zamosc, Poland, in Fall 1971. This first section is ironically dedicated in toto to All Souls Day or as it is more familiarly known as the Day of the Dead. It is a holiday celebrated throughout much of the world and it represents the respect and remembrance of the dead by the living. While one might expect a book of history, national or individual, to begin with a birth and move forward developmentally (the form of the bildungsroman) Steve Carter thwarts such a remote idea, as history is replete with death (though it naturally has its births to offset it). Ironically, while every poem begins with the dirge The Day of the Dead, 1971 in Poland marked the very first time in history that the nation engaged in fully competitive democratic elections. The year marked the turning point of a nation that had been at war and under occupation (Nazis and Soviets) for over thirty years. This makes the celebration of the Day of the Dead all the more poignant, as many of the dead had known nothing but deprivation, hardship, brutality, and a lack of freedom; where, in one sense, death was a release from thralldom. It is traditional in Poland on the Day of the Dead to hold bouquets downward, because the flowers have been picked, they are in the process of decay and death, and this is well balanced with the two “elderly Poles,” who themselves are in a like situation, moving ever earthward. The poem also shows the endurance of rituals, even after thirty years of servitude. Death is the “merry” danse macarbre, and even those lighting candles are unwittingly a part of this dance, in step in time in the march towards death. The next section of the book takes place at Anne Frank House in October 1971. We all know the fate of the child Anne Frank. Hiding in the secret annex of the house of her father’s factory in the Nazi occupied Netherlands, she and her family were eventually betrayed and sent to Bergen-Belsen concentration camp where she died of typhus. Her diaries of the times in hiding and the office building where she hid were both saved from destruction and the building is a visitor’s site since the end of the war. Ironically, in 1971, the year Steve Carter writes about, the building was shut down for renovation for the first time since it opened. This was due to the wear and tear of 1,500 visitors a day to the site. The diary, of course, has been a staple reading even to this day. It represented, as Jan Romein, who wrote an article about it, titled "Kinderstem" ("A Child's Voice"), which was published in the newspaper Het Parool on 3 April 1946 that the diary "stammered out in a child's voice, embodies all the hideousness of fascism, more so than all the evidence at Nuremberg put together." It is as if she were alive vividly in memory, in historical, racial memory, that we know what tree she had a fondness for above others. Steve Carter then moves backward in time in the section Relocation Camp: Utah, June 1944. It is exemplary of another great injustice in history, the internment of the Japanese Americans in concentration camps during WWII. The section is further witness to the fact that history, though moments are select, repeats itself, at least inasmuch as it is fraught with brutality. Mr. Carter first relates a personal vignette about his father, who was a social worker at these relocation camps. He treated the “prisoners” with dignity and the family received Christmas cards from repatriated Japanese for decades. But, this personal vignette does not offset the fact that merely because of their race, American citizens were placed in concentration camps based on racial bias and ignorance. In the following two haiku, we have evidence of just what the phrase “to the victor goes the spoils” means. A Nisei is a second generation Japanese, born and raised in America. So, what we see in these two haiku is the fact that the victor of a war always coopts the treasures of the historical past. It is why Walter Benjamin, the great German cultural writer, said “There is no document of civilization which is not at the same time a document of barbarism. And just as such a document is not free of barbarism, barbarism taints also the manner in which it was transmitted from one owner to another (On the Concept of History). From the inexplicable loss of an entire people, Steve Carter “naturally” moves on to Auschwitz in September 1971. For here is the attempt of the complete genocide of a people, and though “reasons” are espoused, really, like the Anasazi before them, the Jewish People are systematically being eliminated without cause or coherence. It is our history, too, not just the Nazis, because as Walter Benjamin noted supra, all the artifacts and treasures the victor receives contain the brutality that possessed them in the first instance. Benjamin has another dramatic representation of this idea from his Concept of History. Then Steve Carter offers the following poem, so brief as to barely be noticed, and yet so poignant for all that. Steve Carter then moves on to Majdanek, April 2010; Majdanek was a Polish concentration camp in Lublin Poland. The barbarity of history knows no limits. Even in the face of impending loss, the end of the war, the Nazi soldiers were ordered to kill Jews as quickly and efficiently as possible, and they did, without any sense that they were killing their fellow man. Or, in these metaphoric poems, we see the triumph of the “redman” over the U.S. Cavalry and the pride and power of the Ghost Dance (a dance associated with an Indian religious movement that some saw as the reclamation of their land and the dispersal of the white man, although its founder, Jack Wilson, believed in peaceful coexistence). While there does not appear to be any direct link between the areas mentioned above in the poems and the drift of radiation poisoning from Chernobyl in the Ukraine, the spread of toxic radiation has been significant from the epicenter of the disaster and has spread to numerous areas in and around Chernobyl. From Chernobyl in 1986, Steve Carter moves to Flanders Field: July 2001, where he documents in his poems the impressions of WWI. And the concurrence of such extreme opposites as “fondled” and “sweet fern” with the “headless torso” even exaggerates the carnage more, if that is possible. It is a poem that has all the violence of a Goya painting in it. In place after place, time after time, Steve Carter has made a moving tribute to historical reality in this book of haiku. It is a rare work, indeed, that can make of carnage, cruelty, barbarity art. Some of the old masters achieved it as it has always been with us, accompanying us through history as perhaps our closest relative, if not friend. Mr. Carter’s Morning Twilight adds a new dimension to the art of haiku. Although difficult subjects have entered into haiku before, never has anyone so single-mindedly stared the rending of life in the face and wrote of it. The author has done so with a loving hand, with a loving rejoinder to us. No need to lecture. No need to moralize. Just present the repetitions of war and violence and cruelty and barbarity in human life and if that does not move an individual to change, if they can, nothing will. It is a work of serious intent and a work worthy of serious consideration.